I’ve often felt wistful about neglected bananas, bruised and languishing in the fruit bowl. So in this in-between season, while waiting for the plump ripe stars of the spring and summer fruit world, I decided to experiment with featuring the banana center stage (rather than in a bowl of granola). Enter this simple but delicious two-layer cake. As to the ripeness of the bananas, they are best for this purpose when densely freckled but not completely brown (save the darker ones for banana bread). I use pastry flour (lower protein content with a fine texture), but all-purpose flour works fine and I also like the addition of almond flour (also known as ground almond meal) for moisture and flavor. 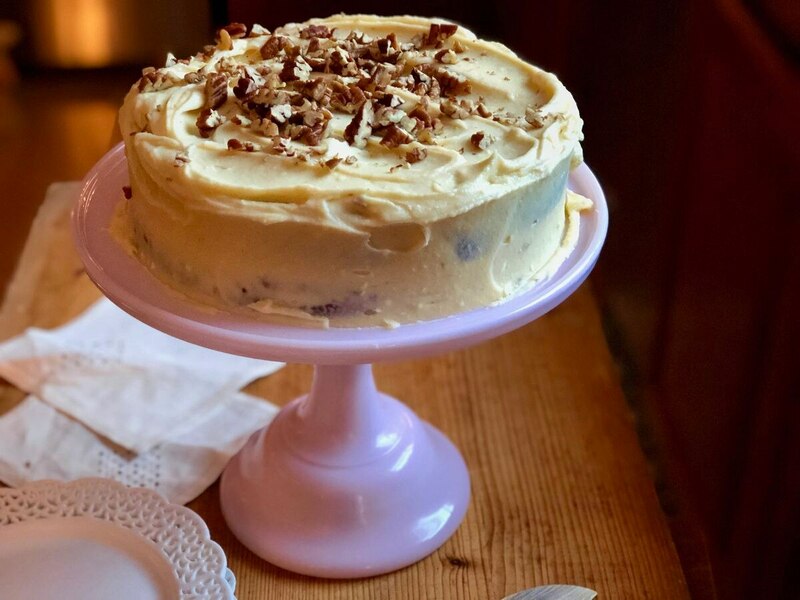 My friend Julie, who inspired me to make this cake, suggested adding slices of fresh banana between the layers, which then got me thinking about adding a peanut butter frosting or almond extract and rum! I’ve restrained myself and am offering up this basic recipe that allows for maximum banana flavor, but if you’re feeling spicy, try adding a pinch of ground cinnamon or cardamom. And perhaps a grated zucchini or carrot? As to the topping, a nice shiny chocolate ganache is easy and delicious, or this creamy vanilla frosting made with cream cheese and mascarpone. Method: Preheat oven to 350 degrees. Butter and flour two 8-inch cake pans. Alternatively, you can grease pans and line bottoms with parchment paper; grease and flour parchment. In the bowl of a stand mixer or using a hand mixer, cream together sugar and butter until well combined. Add egg yolks, one at a time. Add bananas and buttermilk, mixing well after each addition. In a separate bowl, combine flour, almond flour, baking soda, baking powder, and salt together in a medium bowl. Add dry ingredients to wet ingredients and mix just to combine. Separately, beat egg whites until soft peaks and fold into the batter. Divide batter evenly among prepared pans. Bake 25 to 30 minutes, rotating half-way through, or until a tester inserted in center comes out clean. Let cool in pans 5 minutes; gently turn out cakes onto cooling racks and let cool completely. Cakes can be baked, cooled completely, wrapped in plastic and stored in a cool place or in refrigerator until ready to assemble. To make frosting: Cream together cream cheese, mascarpone, and butter until light and fluffy. Slowly add in 2 cups confectioner’s sugar and blend until smooth and fluffy. Add juice, salt and vanilla; blend just until combined. If frosting is very soft, let chill about 15 minutes in refrigerator before frosting cake. Frosting can be made two days in advance and stored in an airtight container in refrigerator. Assemble cake: place one layer in center of cake stand or serving platter. Top with a layer of frosting. Place second layer on top and frost top layer and sides. Sprinkle with toasted nuts if desired. ADN food columnist Kim Sunée is the author of the national bestseller, "Trail of Crumbs: Hunger, Love, and the Search for Home". Her writing has appeared in Southern Living and Food & Wine, and she's been a guest judge several times on the Food Networks "Iron Chef America". Her latest book is "Everyday Korean." She's based in Anchorage.